Mark Pavidis is old school. He’s been making A-mains at big races since some of today’s younger pro racers were in diapers. He has raced for some of the biggest companies in our industry, and has helped developed some of the most influential chassis, tire, and component designs in the RC world. Mark has been competitive at the top levels of RC racing longer than anyone from any part of the world, and many racers from any generation regard him as one of the toughest competitors they’ve ever faced. He has won U.S. National championships in several classes, including 1/8-Scale Buggy. Along with Japanese legend Masami Hirosaka, Mark is the only other driver to win IFMAR World titles in both on-road and off-road competition. Unlike Masami, or any other driver, Mark is the only driver ever to win IFMAR World championships in both electric and nitro competitions. His 2006 IFMAR 1/8-Scale Off-Road title reaffirmed his place in RC history as one of the best racers of all time. I sat down with Mark at AKA’s new offices in Murrieta, California, to discuss the most common adjustments available on today’s nitro buggies. When Mark Pavidis talks buggy setup, we listen. Camber is the relationship of the tire to the ground, such that a tire that is perpendicular to the racing surface has zero camber. If the top of the tire leans in toward the car, it has negative camber; likewise, a tire that leans outward at the top has positive camber. Front Camber. Adding more negative camber to the front of your buggy will make your car less aggressive, especially when turning into the corner. More negative camber will also lessen the chances that the front tires will catch on ruts or bumps. Mark says, “On rough or high speed tracks, adding more negative camber is an important adjustment to make.” It’s usually best to start with a little bit of negative camber in the front. 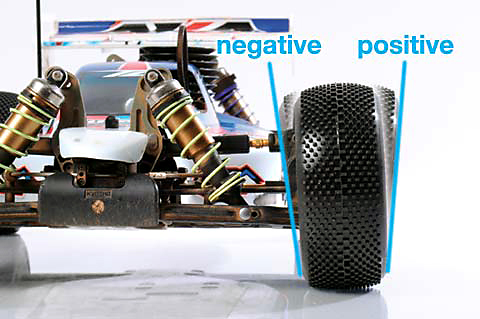 Taking away negative camber (or even adding positive camber) to the front of your buggy takes away a little bit of overall steering, but will make your buggy steer into the corner more aggressively since the corner of the tire will dig into the track’s surface. This can help on slower tracks with plenty of high-speed corners. Rear Camber. More negative camber in the rear tires will free up the rear of the car, making it whip around by taking away lateral traction. As with the front of the car, more negative camber will help your buggy navigate through rough sections of the track. Running less negative camber in the rear will take away a little bit of overall steering, but your buggy will handle more responsively. If the track is not bumpy and has good traction, try running less negative camber to help carry more speed through corners. The optional camber link mounting holes alter the rate at which the camber angle changes throughout the suspension’s movement. For the purposes of making only the following changes, you should reset your camber angles after moving the camber link locations. Outside (on the front hub). A longer link means the camber will change less as the suspension compresses, which will make the car turn in harder but push exiting the corner. Moving to the inside hole will give more camber rise, which smooths out initial turn-in but adds steering through the middle and exit of the corner. Inside (on the shock tower). Raising the inner mount will keep the front end more flat. On high bite and smooth track, this will smooth out your car’s steering response and make it easier to drive. Lowering the inner mount will add body roll and make the car more aggressive. Mark almost always runs the lowest hole available. Outside (on the rear hub). A longer link gives less camber rise, which means less traction. On a high speed track with high grip, this will add more support by eliminating body roll. A shorter link equals more camber rise and more traction. Because a shorter link will make the rear of the car feel softer, it will better handle rough sections of the track. Moving the inner camber link mount to the inside or outside hole will have the same effect as changing the length of the link on the hub. 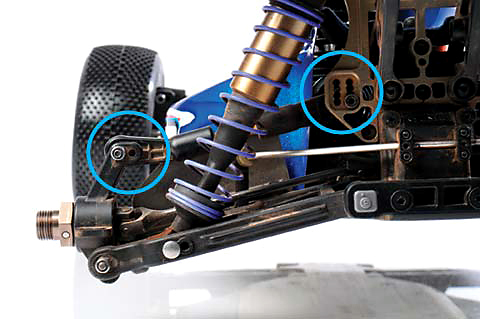 Raising the link on the rear shock tower will keep the buggy flat through corners and have less camber rise; this is a good adjustment to make on a smooth track with high traction. Lowering the link will add camber rise and make the car more forgiving when the track is rough. Moving the link out on both the shock tower and the hub, which will keep the camber link the same length, will add support and make the rear of the car feel stiffer. This is the angle of the tires when compared to the centerline of the car. A tire that has zero toe is pointing straight ahead. Toe-in means that the tires point in toward each other, while toe-out is the opposite. 1/8-Scale Buggies almost always run toe-out in the front. Adding more toe-out will make the car smoother and easier to drive on big tracks, as well as increase low-speed steering by decreasing the car’s turning radius. Likewise, decreasing toe-out (even to the point of running zero toe) will give the car more initial steering response. This is usually only done on tight, low-speed tracks. The rear of the car is much different, as toe-out is never used. Adding more rear toe-in will add overall rear traction, both in a straight line and during cornering. On the flip side, less toe-in will increase steering since the rear tires will have less traction. Also, the rear suspension and driveshafts will be at less of an angle, which will help on rough sections of the track. 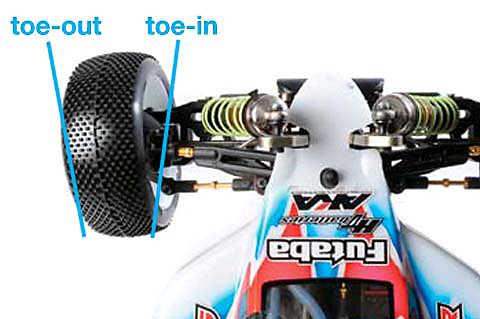 Mark says, “Nine times out of ten, I run maximum rear toe-in (on the Kyosho MP9, this is three degrees of toe-in per side). The only time I run less is in truggy, because there’s already so much grip.” Also, he suggests only changing the inner pivot blocks to adjust toe-in rather than using rear hubs with different angles of toe-in. Changing the rear hubs will increase the angle of the driveshaft joint and change how the car works. 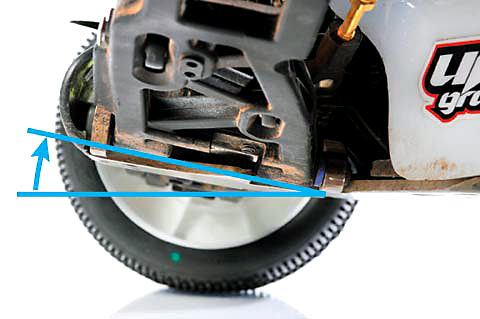 Kick-up is the angle between the ground and the lower inner hinge pins on which the suspension arms swing. Altering kick-up will affect the car much like caster does. In addition, adding kick-up will make your bump higher and further. You should only consider decreasing kick-up when the track has few or no jumps. Tower. Moving the shock in on the tower will make the shock feel more progressive i.e. ; initially it will feel softer, but increasing in stiffness as the shock compresses. If the track is slippery, move the shock in on the tower to add body roll and overall traction. Moving the shock outward will make the shock feel more linear. This will free up the car and make it jump much better. On a track with lots of grip, move your shocks out on the tower to reduce body roll. Arm. Moving to a more inward shock location on the arm will make the buggy feel softer and less stable. For blown out tracks, this adjustment will help navigate bumps and ruts without hurting the car’s jumping performance as much as moving the shock inward on the tower. An outer shock position on the arm will make the car rotate more during cornering, and make the buggy feel more stable. This comes at the expense of rough track performance. Shock Oil. Thicker shock oil will help the car to navigate larger jumps and bumps since the oil will slow the reaction of the shock. 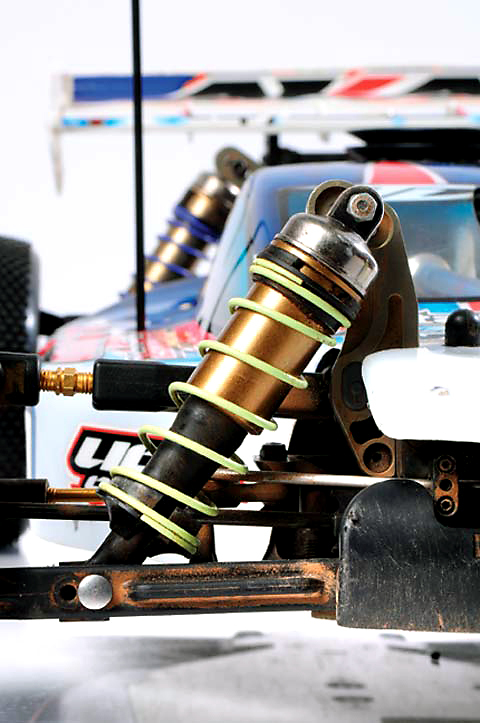 In hot weather, increase the weight of your shock oil to maintain the same damping characteristics. Thinner shock oil will allow the shock to react more quickly, and help your buggy soak up smaller bumps and track imperfections. If your buggy works well in warm weather, switch to thinner shock oil in very cold conditions. Shock Pistons. Choosing the correct shock pistons is quite simple. On smooth tracks with big jumps, Mark suggests using smaller pistons to slow down the shock action. On rough tracks with fewer jumps, reach for pistons with larger holes to allow the shock to soak up the ruts. Shock Springs. Mark doesn’t often change his shock springs to adjust his car. In fact, he suggests changing both the front and rear springs at the same time to maintain the same balance front to rear. If the track surface is slippery, go to lighter springs to create more body roll and slow the car’s reactions. On asphalt, grass or Astroturf tracks with tons of grip, use heavier springs at both ends of the car to resist traction rolling. As you’ll notice, each adjustment sacrifices a particular handling trait to gain another. There’s no magic adjustment to make your car “super dialed”, so decide what your buggy needs to do differently, make changes to your car, and see if your lap times improve. This guide should serve as a perfect compliment to the most useful tool you’ll ever find in your RC career: practice.